It’s no secret to our regular Candy Addict readers that I am slightly obsessed with all things mint chocolate. There is something quite perfect about the combination: the creaminess of milk chocolate matched with the cool snap of peppermint is a marriage made in Candy Addict heaven. So you can imagine how excited I was when I came across Hershey’s Bliss Creme de Menthe candies. 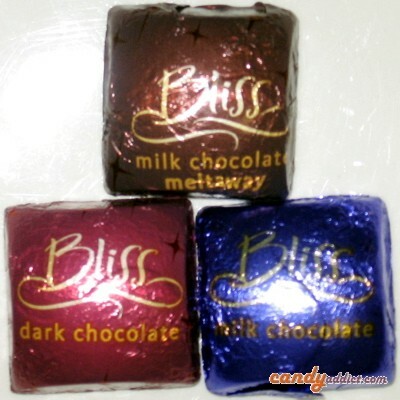 I was already a Hershey’s Bliss fan; their milk chocolate meltaways are currently competing with Dove Milk Chocolate Promises as the dominant milk chocolate pieces in my big red candy bowl. 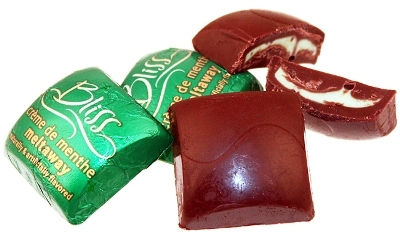 I was actually surprised at how tasty the Bliss chocolates are; Hershey’s chocolate, to me, always seems to have a slightly bitter, waxy taste, but the Bliss pieces are creamy and delicious and the exact opposite of your standard Hershey’s chocolate bar. How do you find your bliss? Hershey’s hopes we’ll all find it in their Bliss Chocolates, and they’re banking on three flavors to satiate our palates. I recently sampled all three – Milk Chocolate, Milk Chocolate Meltaway, and Dark Chocolate. I found that only one of the candies left me feeling blissful. Each variety comes as individually wrapped foil squares in flavor-specific bags. They all have a nice, chocolaty smell, and the color choices for the foil are appealing. I can imagine a cute display of Bliss squares in a candy dish. Cute or not, I’m most interested in taste.